You probably couldn’t tell at first glance, but Brett Young is a man who likes his soul music. Indeed, Brett talked a bit about the influence that artists like Al Green and Marvin Gaye had had on his music when we talked backstage before his performance at the Hamilton in downtown DC. Brett’s music reflects his upbringing quite well, with hints of country, pop, worship and gospel, and soul peppering the tracks of his two albums, 2012′s Brett Young and new release On Fire. Brett is a very thoughtful and emotionally charged artist. Self-described as “really emotional [for a dude]” and “obsessed with lyrics,” Brett’s songs are tiny emotional roller coasters, built by his wording and instrumentation. While one might worry about how songs with such lush studio arrangement translate over to a very stripped down, live setting, Brett proved the strength of his music. 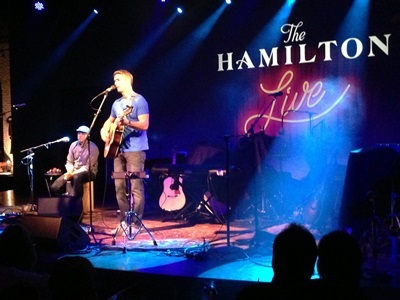 At the Hamilton, where he and singer-songwriter Brendan James opened for Tyronne Wells, Brett was able to fill the venue using only sparse arrangement; with only his own voice, his guitar, and the backing vocals and percussion provided by Jay Ollero, Brett was still able to captivate and move the Hamilton’s audience. Brett accomplished this by putting even more emotion into his voice, and really pulled people into the emotions and the messages of the songs. Part of this is due to Brett’s true skill as an artist: his lyrics. Brett is a great storyteller, both in and outside of his songs. Brett understands what it seems only some artists understand about good music and good concerts: that the concert and the music should be a dialogue. Brett took every opportunity he had during the show to talk to the audience. He told stories about the genesis of the songs, stories about the stories behind the songs, and just stories about himself in general. Brett made it clear that he wanted the audience to get to know him and his music, and that he legitimately cared about their being there. With only five songs available for his slot, Brett did everything he could to make it a strong and concise introduction of himself. Brett poured his heart into the songs when he wrote them, and he made that same magic come alive on stage. We need more storytellers like Brett Young in popular music today – he is funny, touching, mature, and most importantly, captivating. I, for one, hope to hear Brett’s stories for many more years to come, and hope that many more people can grow to appreciate them as well.